Is it fun or embarrassing staying in a Hard Rock Hotel? I’m met at the San Diego airport by Erin, who works for Zimmerman Group. It’s the PR company behind a weekend-long journey I’m taking to the Hard Rock Hotel San Diego. Ask the average A.V. Club reader what kind of person stays in a Hard Rock Hotel, and the answer would probably be “a dork.” Still, both Erin and her colleague Jill, who are our guides for the weekend, are almost unforgivably nice. They usher me into a special “Rock Royalty Lounge” hidden behind the public check-in front desks, an elite perk presumably created so that any actual famous hard rockers can flee the pleasing confines of the lobby area, and escape to the even more relaxing and comfortable seating that also doesn’t risk containing any normal human beings who may attempt to interact with the wealthier, and therefore better, people. I’m checked in by an appropriately “rock” concierge, which is to say, a regular guy wearing a leather-inflected outfit. He offers me a drink while I check in, the first of what will be approximately 4,000 times I am offered alcohol over the ensuing day and a half. I’d been invited to try out the hotel’s new WAX program with all expenses paid. In essence, the chain now offers its guests the chance to have a portable record player in their rooms for the duration of their visit, accompanied by a collection of curated vinyl albums. The Hard Rock Hotel is hoping this is just the kind of perk that will convince young fashionable people to give its accommodations a shot, which is understandable when you see that boutique hotel chains like the Ace Hotel have already instituted similar initiatives, and are reaping the monetary rewards. The Hard Rock Hotel San Diego has employed an agency to fly an assemblage of journalists out for a couple of days, in order to tout the many benefits of its rock ’n’ roll-inspired culture, including a live show, fancy meals, and an agenda aimed at making us all sated and happy, presumably in hopes that we then return to our various publications, we’ll be newly converted to the cause of stumping for the Hard Rock Hotel. I’m perfectly happy to say I enjoyed my stay—not hard when there are people dedicated to making your entire stay a superlative encounter—but I’m more interested in the pop-culture impact possessed by something branded as “Hard Rock” in 2017. Is there a problem with the Hard Rock label? I remember what the problem used to be: The corporatization of something over which people feel a keen sense of personal affinity. Rock music long retained an affiliation with a countercultural attitude and identity, an antiestablishment ethic that, if nothing else, gave people a sense that the art they liked wasn’t part of some impersonal or fraudulent sleight-of-hand, snake oil marketed to rubes by slick businessmen. And every time grunge or emo or punk emerged newly ascendant in the musical landscape, it reenergized that connection of authenticity and rock. Hard Rock Cafes and Hotels felt like the embodiment of sell-out culture, the real-estate equivalent of saying, “Hey kids, you like Radiohead, yeah? Well, here’s the Goo Goo Dolls! Same thing, right?” It was your dad in cargo shorts, wearing a fanny pack and a Foreigner shirt while inviting your friends to check out his record collection. Only, that’s not necessarily the case any more. Once any art form exists long enough, it becomes ripe for assimilation just like anything else in capitalism, and demanding fealty to some imagined integrity-laden past that no longer exists is as foolish as paying 40 bucks for a CBGB’s-emblazoned shirt. Things that were embarrassing 20 years ago become part of the furniture, or even nostalgically appealing. Much like the Rock And Roll Hall Of Fame, another silly, bloated endeavor that nonetheless manages to perform the useful business of slowly institutionalizing something that once fancied itself anti-institutional, the Hard Rock Hotels are about providing guests an opportunity to live in the world of an older era of music history, surrounded by a building dedicated to celebrating and preserving the iconography of musicians. And unlike the Hard Rock Cafes, which tried to make eating a meal into something musically themed, but really just offered the same subpar American cuisine as a thousand other diners—only louder and more irritating—the Hard Rock Hotel is asking you, the American consumer, “Wait, think about this for a second. Don’t you enjoy having good records in your room? Isn’t it enjoyable to walk through the halls and see handwritten lyric sheets from Janis Joplin, or Elton John’s outsize genie outfit from his ’70s touring days? Wouldn’t you prefer to be surrounded by things you enjoy, rather than bare walls and a narcotizing Muzak vibe?” Of course, the answer is almost certainly yes; we all prefer to be around like-minded people in places that speak to our sense of self. But those seemingly logical queries are the wrong questions. Although we all like the feeling of a personal connection to the world around us, the question is how impersonal we want our personal experiences to be. I immediately get a little lost following the complex directions to the elevators (“Turn right”), but eventually learn that if I walk headfirst into an exhibit displaying the bass belonging to Mötley Crüe’s Nikki Six, I’ve arrived. Up on the 10th floor, I enter my room and immediately celebrate the presence of two televisions, one for each of the rooms loosely separated by a middle bathroom area. It’s more than a little embarrassing how quickly I become enamored with my surroundings. It’s a very nice room, with good decor and one of those showers where the water comes out of the ceiling straight down onto you. I head over to play with my vinyl collection. It’s accompanied by a Crosley record player, which a music editor colleague of mine has described as turntables “for babies. From Urban Outfitters.” Still, it does the job nicely for the duration of my stay. The person who curated my records has erred badly by thinking I want to listen to The Clash’s London Calling, which is sitting on the Crosley, awaiting a spin. Still, I put it on, because I don’t want them to feel bad. It turns out I needn’t have imagined the hardworking record collection curator looking at my profile and selecting records based on intuitive guesswork: Every person gets the same collection of music, which is best described as “rock standards.” The Essential Bob Dylan, Dark Side Of The Moon, Thriller, Back In Black, Born To Run, Johnny Cash… maybe the people at the Hard Rock Hotel know more about their normal demographic than I do, because I would’ve thought at least one woman artist merited inclusion in the collection. Still, I am thrilled enough to be here, despite my impostor syndrome about staying somewhere so nice. (A hotel employee knocks on the door to do a quick check that the minibar is stocked, and I react like Chris Christie at a Bruce Springsteen show—i.e., I don’t really deserve to be here, and I’m scared she’ll sense it, so I put some bluster in my stance and casually mention my press credentials. She looks at me with the kind of pity you usually reserve for children caught pretending to be something they’re not, which is to say, Chris Christie, again.) I’m satisfied to an immense degree by the trappings of the Hard Rock Hotel San Diego—so much so, I start to wonder: We now live in a world where multiplatinum pop stars and avant-garde art-punk provocateurs alike pay their bills by licensing music to phone companies and fast food chains. Has Hard Rock Hotel just been around long enough to now seem like an acceptable part of the landscape, or have I just been seduced by sheets with an absolutely smashing thread count? This is, after all, the same company that began with something called the Hard Rock Cafe, a massive chain of music-themed restaurants birthed from a single location in London. If you’re looking to assess authenticity from the ground up, you could do worse than to have the backstory of the original Hard Rock Cafe. Founded by rambunctious American expats, the first bar and restaurant was by all accounts a genuinely cool place, somewhere so connected to the musical culture that gave it its name, Eric Clapton had a regular seat at the bar. (That’s also how the memorabilia angle began: Clapton donated a guitar to hang above his seat, the better to convey that this was Eric Clapton’s seat, and everyone else better damn well steer clear. Pete Townsend of The Who quickly followed with a guitar of his own, and the memento snowball started rolling down the hill.) Other locations soon followed, capitalizing on the legitimate cache of cool incurred by the original. It’s hard to say when Hard Rock transitioned from being associated with hipness to gauche, touristy silliness, but the incorporation of the company probably contributed, as it became a mass-market phenomenon, thereby following the same path as countless other small businesses that become mega-successes, and immediately lose the elitist appeal that defined their initial victory in the niche market of cool. By the time Planet Hollywood followed the same trajectory in 1991, selling the presence of keepsakes from movie stars and sets during your meal, whatever stockpile of authenticity it may have once possessed receded into the neon glow of middle-America pandering. But where the Cafes seem to be on the way out, the Hard Rock Hotels are flourishing, and I think it has something to do with the experience of a room of one’s own versus the flash-in-the-pan nature of eating food. One of my fellow writers, a food and travel expert, offers a simpler argument: The glitzy promise of rock history lured people to the Cafes, but the food sucked. So once the curiosity was sated, people never went back. ”It wasn’t a brag-worthy experience,” she says, pointing out that the hotels are equipped to evolve with a rapidly changing culture: Bringing in indie bands to play the hotel venues, letting people tour the exhibits and experience the historical elements of rock memorabilia at their own pace… all of it creates a more appealing and less gaudy-seeming experience. Point being: When it comes to feeling you’ll get your money’s worth, the Hard Rock Hotel has a big leg up. I get up from the chair in the “relaxation room” where those receiving massages from the Hard Rock Hotel San Diego’s “Rock Spa” wait after changing into the bathrobes provided for the experience, and where I have spent the past four minutes sharing a deeply uncomfortable silence with a middle-aged woman sitting across from me, both of us doing our best to soak in the new-age ambience while pretending someone else isn’t two feet away. I follow my massage therapist into the room where I’ll be experiencing the “Rhythm And Motion Synchronicity Massage,” a 50-minute process wherein a continual soundtrack of soothing music radiates from a speaker right above your head, and in which the massage table vibrates in tandem with selected low-end musical moments. Only, I’m immediately confused, because there’s an electric guitar lying on the massage table, taking up the space I am presumably meant to occupy. I have no idea why this guitar is here. I look in puzzlement to the massage therapist, but she’s already asking me which of the three playlists I want during my experience. On her advice, I select “Ultimate Chill,” which turns out to be a mellow version of new-age drone periodically interwoven with things like the synthy bloops of the intro to Postal Service’s “Such Great Heights” or a barely recognizable instrumental take on “Wicked Game.” She then picks up the guitar and places it on the wall. My normal fear during massages is very simple: I worry that the person kneading their hands into my back is a serial killer, and that at some point they’ll stop, prompting me to look up, revealing a sinister rictus of a smile looking down at me, right before they snap my neck between their muscular hands. Just the odd intimacy of a stranger rubbing your back always triggers social anxiety in me, so I don’t ask her about the guitar, even though I’ve been thinking about it daily ever since. Is it meant to simply remind you you’re at the Hard Rock Hotel? Because I can assure you, when you’re staying at the Hard Rock Hotel, it is very hard to forget. Have you heard of Rebel And The Basketcase? There’s a very good chance you haven’t. The band is one of the ”brand ambassadors” of sorts for the Hard Rock Hotel’s new “The Sound Of Your Stay” vinyl program. There’s a much better chance you know the band’s singer-keyboardist, Evan Rachel Wood. The PR people organizing our group Q&A session with Rebel And A Basketcase (Wood and her fiancé, Zach Villa) are very aware of why you know her these days, which is why they’ve asked us to please not spend the entire time asking Wood for stories about Westworld. They sound very ’80s, like music from a John Hughes film. That makes sense, as they met while doing a theater piece based upon reenacting scenes from John Hughes’ oeuvre, and started making music out of a love of the music and aesthetic of those films and that era. It’s not really my cup of tea. Nonetheless, I try to do my part, asking them which ’80s film they would most like to live inside. (“Some Kind Of Wonderful,” Wood replies, without batting an eye. Later, she shows me this was no flip answer: She has a tattoo of the signature of Watts, Mary Stuart Masterson’s drummer character from the film, emblazoned on her bicep. Thankfully, I manage to resist replying to her with, “All I care about in this goddamned life are me, my drums, and you.”) We also learn that Sia is her go-to karaoke artist, and Villa announces that ’80s-influenced music has only just now arrived in the Top 40 with the latest Paramore album, which seems factually wrong, but they are both very nice, so I don’t quibble in the moment. Rebel And A Basketcase proceeds to play a set, featuring a new drummer and bassist they recently began working with. It’s ramshackle and patchy at times, like the band is still figuring out how to play together live, but that actually contributes to the charm, because ’80s-aping music with lots of programmed synths and processors is prefab enough without trying to gild the lily. The lack of smooth performance chops works in their favor, making for a far more real and relatable set, both of them revealing themselves as earnest nerds just trying to put on a show, with the caveat that half of the duo stars in one of the biggest TV shows on the air. They don’t have an album out yet, but there are multiple songs you can listen to online. I would recommend seeing them live, as the icy retro sheen of the recorded tracks loses quite a bit in translation. 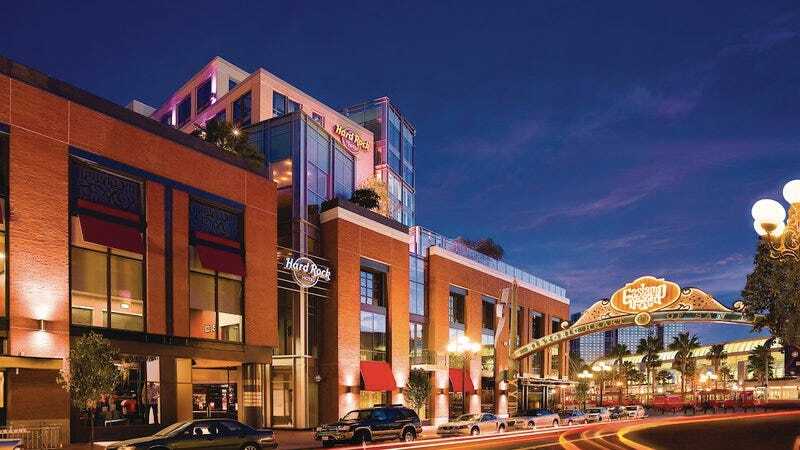 Other artists have made similar deals with the Hard Rock Hotel, like Michelle Branch and New Politics, which again signals the difference between the restaurants and the hotels—or other hotels and this one, really. Having likable and appealing indie bands playing in the bar downstairs from your room is one of those things that, again, objectively is something I would always like to be happening if I’m away from home. Is it somehow less authentic of a musical performance than if they played in some small club? I’ve seen too many good shows at the House Of Blues by now to be lofty about such things. As fans, we go where our favorite bands lead us; I support small businesses on Record Store Day, but there’s not really an equivalent pressure in the hotel game. Especially not in big cities. When your choices are the Hampton Inn, the Four Seasons, and other chains, why not pick the one that at least is tangentially trying to offer you things you like? Maybe I don’t think it’s as lame as I did when I began this process, but only because I’m realizing my prejudices might be misguided. James, our tour guide of the hotel’s memorabilia, makes sure we have filled champagne flutes before he offers a toast and makes a point of stressing how the Hard Rock Hotels are better than the Cafes, which, again, seems to be a recurring theme this trip. James’ official job title is “Vibe Manager,” which is a very easy thing to make fun of, but his responsibilities are basically a combination of interior designer and general manager. He curates the playlists in the various amenities and guest services (including my “Ultimate Chill” massage soundtrack), as well as selecting the lighting, design, even the scents from room to room throughout the hotel. I am thinking of asking him what it is about hand towel racks that he feels would kill the vibe of my room, but I don’t want to be churlish. James walks us through the hotel’s collection of keepsakes, instruments, costumes, and more, pointing out little facts about each one along the way. This is the moment I learn that none of my fellow writers, PR reps, or hotel employees are really A.V. Club-types, because everyone seems very in awe of James’ recall of details (“He’s an encyclopedia,” I hear one publicist say to another), but a) he doesn’t really seem to be dropping much trivia beyond what’s covered in the fine print on each installation, and b) it’s all pretty standard Music Nerd 101. (Do you know how Bruce Springsteen got the nickname “Boss”? So does James.) But it’s stupid to act like everyone should know the same trivia you do—I would be equally clueless were someone to explain to me, say, the basic rules of American football outside of “hike” and touchdowns—and I am far from a walking encyclopedia myself, so I shut up and listen. The exhibits are a mix of cool and silly, which once again seems to summarize the entire Hard Rock Hotel experience. Our first look is at Shakira’s leather crop top, which sits right next to Stevie Ray Vaughan’s guitar, which, for old-school fans of the legendary blues-rock guitarist who don’t appreciate modern pop, is probably a slight akin to his helicopter plunging to Earth all over again. They’ve got one of Madonna’s lace bustiers from the “Like A Virgin” tour, which is pretty neat, and a guitar from Timothy Schmit from the Eagles, which is not. There are lots of little set lists and notes from everyone from Stevie Nicks to Springsteen, the latter having bequeathed them a note wherein he asks for more watermelon backstage, finally creating the rare moment of overlap between my own views and what the Hard Rock Hotel defines as rock ’n’ roll. Ultimately, I don’t think the Hard Rock Hotel has an image problem with music fans, per se. I like pretty much everything it has to offer, and this trip has helped me realize I don’t really care much any more about the punk rock distinctions of authenticity vs. impersonality, at least when it comes to which chain hotel I’ll stay at on vacations. Instead, I think the Hard Rock Hotel has a guest problem—specifically, it plays host to a lot of douchebags. I didn’t notice this until Friday evening, when we gathered down in the lobby before our memorabilia tour. The place was packed with people checking in, mostly younger folks in their 20s, at least several of whom seemed to be arriving for bachelor and bachelorette parties. There’s easily a couple of dozen dudebros standing around who seem ready for a Diplo show, or maybe a Chainsmokers concert. That’s just a shorthand way of saying they look and talk like Trump supporters, a sentiment borne out when I overhear a few of them making jokes about “libtards.” I can embrace my cuck-ness with the best of them, but it doesn’t mean I want to be surrounded by sentient versions of Twitter feeds I’ve blocked. The Hard Rock brand is a part of the pop-culture lingua franca, something recognizable to most Americans, albeit for very different reasons. Even the name—”hard rock”—has been pried apart, detached from whatever musical styles would be applicable, instead functioning as a nonsensical substitute for a simpler phrase: “Music that people know.” Some see it as a goofy tourist destination, a place that revels in a kind of musical kitsch, for good or ill depending on your perspective, though it seems a clear mix of both. It appears to draw a certain demographic, however, which might charitably be described as, “People who would be psyched to go on an MTV reality show.” That might be part of what it’s trying to change with this vinyl initiative. Whether it works will depend on the ability to shake a label that probably does more harm than good at this point.